Shoes in sizes EU 25/26 - 36. Appropriate for long-lasting walking and playing outdoors. Outside: 100% natural leather, formaldehyde and azo dyes free. Lining: 100% natural leather, formaldehyde and azo dyes free. - sizes 31 to 36 - 6 mm flat Vibram® Superflex (more durable and with even better grip and elasticity than the 5 mm Vibram). Vibram® are leaders in manufacturing of soles and sole materials.The Vibram® rubber has excellent non-slip characteristics, flexibility and elasticity. The softness of the sole provides maximum barefoot feeling and acts as a natural shock absorber. Thus the sole stimulates the foot receptors and helps the foot development. These shoes are suitable for long walks, riding a bike, playing and spending all day at the kindergarten. Their construction is as lightweight as possible and they lack fastening and hard elements. 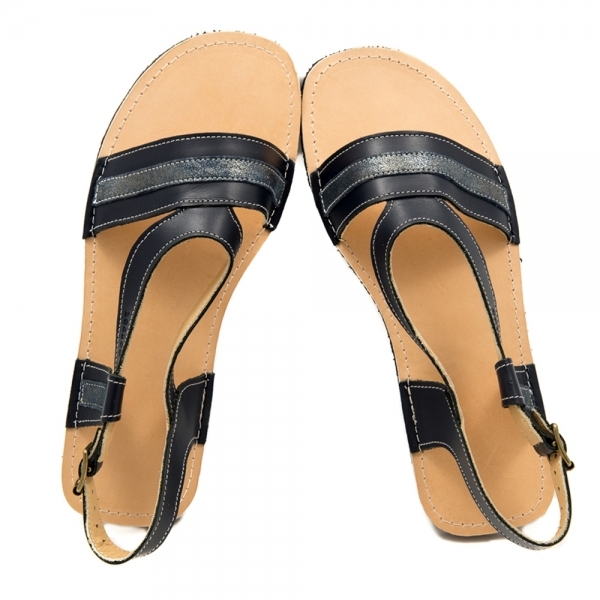 The sole is amazingly flexible and gives a barefoot feeling. At the same time, the sole is dense and compensates for the bumps when walking on uneven terrain. The inner dimensions of this model are described in the table below.The feet lenght should be in the range in column " RECOMMENDED FEET LENGTH". The circumference around the widest part of the toes should be maximum the numbers written for each size in column "MAXIMUM CIRCUMFERENCE (TOES)". We can make a correction in the top front leather part to correct the width of the shoes with +/- 1 cm, which we make by hand and we charge extra €7 for making the shoes narrow or wide. You can add the extra charge here.